Hooray, a new WoolfCamp is coming up!!! It'll be another weekend Chez Grace, to exchange good ideas and good will - and to read poetry. I had a good time monkeying with Odeo. Surely will do more of that - see you on the elkit channel. ... and last but not least, take to heart what Lisa Stone said: Own the fact that you're a writer. 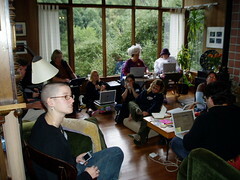 Not ready to let BlogHer go, so I am at Badgermama's house for the Afterglow WoolfCamp. Happily ensconced at WoolfCamplet at Squid's house, glad to see my fellow campers Grace and Mary and Jen and Em and Liz and Jo and Squid of course, and thrilled to meet Ep and Jon. Jo raises the question of Memoir Writing. Why indeed do we write? And why so publicly? I know I am not contented to write offline any more. Why that is, I can't really say. On a sorta related side note, Rich and I were talking about blogs last week, as I reported from SXSW. One of the panels on surveys mentioned that the most widely read blogs are the personal blogs. And I pointed out to Rich that the term "personal blogger" seems derogatory, especially in the media, and how Dooce got described not as a "personal blogger", but an "IDENTITY blogger". Rich responded that he considers himself a memoir blogger. Crossposted from the WoolfCamp blog and expanded, because I've had a few more days to think about it. Mary recounts an interview and asks, How would you answer the question, "Why do you write?" I am stumped. I have never thought about this, partly because I still stubbornly hold that even though I write, I am not a "Writer", and partly because I have written like this for so long (short-attention span writing, first in letters, then in emails, now in blog) that it is completely normal to me and has never even occurred to me to question why. I will ponder this, though, and write more about that. So now I have pondered it, and I agree with my fellow WoolfCampers and writers on several items. Like the author interviewed, Firoozeh Dumas, I find writing "immensely rewarding. A well-crafted sentence makes me beam every time." Like the commenters in Mary's blog, and Mary herself, writing helps me to organize my thoughts, get clarity through the process of structuring blips into sentences, and to remember things. But those are side effects ... what is the driver? I am almost there with Grace, who says she writes because she can't help herself. I know I missed blogging when I abandoned it for a month or so, and I continually "write" in my head. I almost always simultaneously observe the things I experience. Me? I write, but I am not a writer. I'm closer to being a writer now, but the Writer eludes me (which is fine). Some days it's like an itch I want to scratch very badly. Other days it's like OnePotMeal says: I think about stories and words and ideas all the time, because my brain is all words. But they don't all urge themselves out of my head and onto paper. Most of them are contentedly entrenched within the confines of my skull, and no trepanning is needed. But, like Michael Ende says in the Neverending Story, that's another story and shall be told another time. As is the other story about the itch I cannot seem to leave alone. Gawd, all these great discussions from last weekend continued right over there on the WoolfCamp blog! This is great!! Now I don't even feel so bad that I missed out on a few conversations, because I still get to hear what went on, and can add my twelve cents (I always have more than two). I think quite a lot about who my audience is and how it changes what I write and what I leave off. I write openly under my own name, and there is no other Elke Sisco anywhere in sight on the interwebs, so I am easily enough googled by friends and exes and employers. So I try not to be a different person on my blog than I am in "meatspace", although I am very clear about the fact that my blog is just a smallish part of me. In the discussion we had at WoolfCamp, I said that one of my rules for blogging is that I won't blog anything that I wouldn't say out loud in a crowded marketplace where I don't know who overhears me. I don't know who overhears my blog, and unlike the marketplace, it is not fleeting. Once it is on the net, there it stays, courtesy of the Wayback Machine and other divine/devilish tools. Later, it occurred to me that although my marketplace rule still holds true, there are more things now I would say openly - my repertoire is expanding. I am much less concerned about what people think of me, because I assume they have already seen me, warts and all, heard me swear, seen me on a bad day - it feels to me as though living my life in the semi-public space on the web has made me a more ... what's the right word .. cohesive person. Oh yes ... audience. Of course I don't know who my audience is, because anyone can find my blog. And since I use song lyrics for entry titles, I get a lot of hits from lyrics searches. But who do I write for? Sometimes I think that I write for myself (because I try not to skew my writing for an audience; if you don't like my blog, don't read it), but that is not really true. I started blogging on Blogger's blogspot, when comments were still an add-on that you had to install, and I remember I was quite reluctant to add them. I was worried about being flamed and spammed, and I didn't really want to know other people's opinions about my thoughts and feelings. Now I wouldn't want to miss the dialogue any more. Being able to interact with others on my blog, and with other bloggers on theirs, rather than just speaking into silence and listening quietly elsewhere, is one of the reasons that keep me here. We were the missing audience in our discussion. We read each other, and blog for each other. We blog for the people whose blogs we admire, for the people who inspire us. When we start paying attention to each other, and blogging for each other, we become a literary movement and a powerful force. We don't write just for each other, but we write knowing that particular other writers are looking. I think it's true ... and I have become part of that group like I have any other in my life: by starting out on the sidelines, playing contentedly by myself, but paying attention to the others around me, and open to interaction with them, making connections along the way. You may notice that my "Hey, I Know You!" blogroll is much elongated. This is all thanks to the WoolfCampers. Small pieces loosely joined, bumping into each other pleasantly. Back home, after a wonderful WoolfCamp weekend. Great energy. Great discussions. Great food and drink. Great company. And I do think it makes a great difference to be surrounded by a majority of women. We all treat each other with respect and warmth, and just naturally assume that we're all awesome. And the cool thing is that that makes it so. Thanks, all you awesome WoolfCampers, for a great set of new connections that I am sure will only strengthen over time. And of course an extra-special thank you to our un-hostess Grace Davis, who Arr Oh See Kay Esssss. Yes, ALL IN CAPS.